Above: Bryant Washburn in the serial King of the Royal Mounted (Republic, 1940). A popular leading man in the silent era, Bryant Washburn, like so many other silent stars, frequently found work as a portrayer of respectable and responsible supporting characters in sound serials. Though gifted with a compelling speaking voice, Washburn was younger in appearance and less grave in manner than most other specialists in upright roles; however, he carried off such parts in fine style–relying on gentlemanly suavity, not solemn dignity, to make his chapterplay characters seem properly distinguished. His lack of a stereotypically dignified appearance made it easy for him to handle villainous roles, too; the majority of his serial parts were sympathetic ones, but he also turned in several excellent performances as memorably contemptible serial heavies. Franklin Bryant Washburn III was born in Chicago, to a New Hampshire father and a Danish mother; the former, a salesman by trade, relocated his family from Illinois to Racine, Wisconsin during young Washburn’s childhood, but later moved them back to Chicago. Washburn completed high school there and began pursuing an acting career almost immediately afterwards; he made his stage debut in 1907 at the age of 18, as a member of Broadway actor/producer George Fawcett’s theatrical company. Washburn found little success on the New York stage, however, and went home to Chicago in 1911; there, he secured a job as a film actor with that city’s Essanay Studios. He worked in Essanay’s short dramas, romances, and adventure films for the next six years, initially playing in support of stars like Francis X. Bushman but eventually rising to leading-man status. By 1917, he had established enough of a name for himself at Essanay to attract offers from other production companies; he left the Chicago studio to freelance in 1918, and signed with Adolph Zukor’s Famous Players-Lasky Corporation (later known as Paramount) before the end of the year. Settling in California, Washburn worked as a leading man for Zukor through 1920 and then began to freelance again–playing both primary and secondary leads for Fox, Metro, and other major studios during the first half of the 1920s. Though Washburn kept playing prominent screen roles during the decade’s later years, the big studios began to lose interest in him as age and weight obscured his boyishly handsome features; his well-known name won him some latter-day leading roles in films for small outfits like FBO and Sunset Pictures in the closing years of the 1920s, but he was already transitioning to character-acting roles by the time the sound era arrived. Washburn’s mellow voice and unaffected acting style made it easy for him to adjust to talkies, but his slide down the Hollywood status scale continued nonetheless; he worked almost exclusively as a supporting actor in low-budget independent productions or in bigger studios’ B-films during the 1930s. Among those independent productions was his first serial, The Return of Chandu (Principal, 1934)–in which he was cast as Prince Andra, a globe-trotting Indian nobleman and a good friend of world traveler and white-magic practitioner Frank “Chandu” Chandler (Bela Lugosi). The Prince allowed Chandu to use his yacht to help Egyptian Princess Nadji (Maria Alba) evade the black-magic Cult of Ubasti, but was murdered in Chapter Four after cultists invaded the boat. 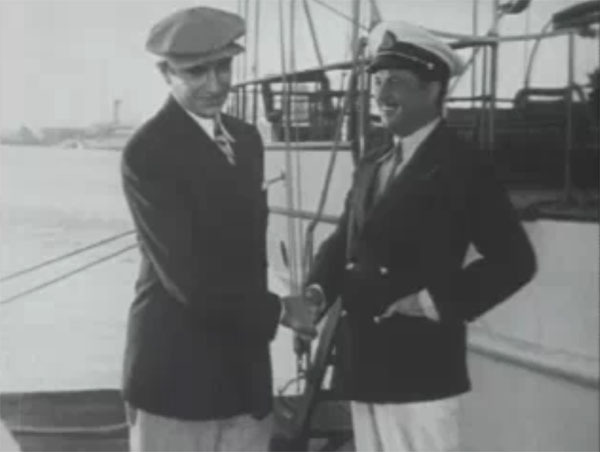 Short-lived though Washburn’s role in Chandu was, he made his character quite appealing–playing the Prince with a likable combination of aristocratic self-assurance and easygoing affability. Above: Bryant Washburn bids a cordial farewell to Bela Lugosi in The Return of Chandu (Principal, 1934). Tailspin Tommy (Universal, 1934) gave Washburn a sizable character role in its later chapters as a movie producer and director named Grant, who presided over an aviation film-within-the-film in which young pilot Tommy (Maurice Murphy) played the starring role. His briskly authoritative but patient interactions with the awkward young hero and his even more awkward pal Skeeter (Noah Beery Jr.) were fun to watch, particularly when he good-humoredly tried to direct the embarrassed Tommy in his first romantic scene. Above: Bryant Washburn grins as he sees his directorial strategies starting to pay off in Tailspin Tommy (Universal, 1934). Noah Beery Jr. is on the far left. 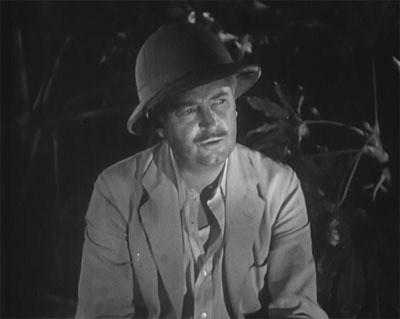 Washburn played his largest sympathetic chapterplay role in the 1935 Universal jungle adventure The Call of the Savage; he was cast as Dr. Harry Trevor, a dedicated scientist who discovered a cure for infantile paralysis while conducting research in the African wilds. Unfortunately, Trevor’s camp was destroyed by fire shortly afterwards; his assistant and his wife were killed, while he was seriously injured and developed amnesia as a result. His young son Jan was lost in the jungle and grew into a Tarzan-like “wild boy” (Noah Beery Jr.); father and son were eventually reunited, the elder Trevor’s memory restored, and the lost formula rediscovered–but not before many battles with natives, animals, and some unscrupulous former colleagues of Dr. Trevor’s. Washburn was given several good opportunities to display smooth intelligence and energetic heroism in Savage’s first episode (before Trevor lost his memory) and in the serial’s last four chapters (after the doctor’s memory returned); he also received plenty of screen time in the intervening episodes, but spent most of it staggering around in an amnesiac haze and brokenly calling out “Jan–my boy, Jan.” Limited as his dialogue was in the serial’s mid-section, he managed to infuse it with some genuine pathos, and conveyed Trevor’s mental confusion without overacting. 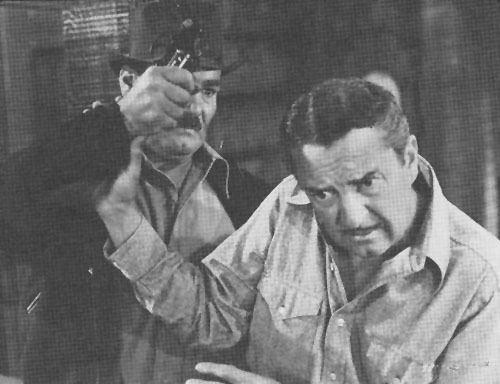 Above: Walter Miller tries vainly to stir Bryant Washburn’s memories in The Call of the Savage (Universal, 1935). Above: Bryant Washburn discovers an expandable bracelet that proves the wounded Noah Beery Jr. is his son in Call of the Savage. Harry Woods is on the right. Tailspin Tommy in the Great Air Mystery (Universal, 1935) gave Washburn a more prominent role than his part in the first Tailspin Tommy serial, but actually gave him less to do than the earlier effort had. As oil tycoon Ned Curtis, the uncle of Tommy’s girl Betty Lou (Jean Rogers), he hired Tommy (Clark Williams) and Skeeter (Noah Beery Jr. again) to conduct an aerial survey of oil fields in the South American island nation of Nazil–a job that soon got the young flyers embroiled in a small-scale civil war. Washburn’s character went along on the trip to Nazil, but took no part in the serial’s action after surviving a dirigible wreck in the first chapter. He was only slightly more prominent in serial’s dialogue scenes; he remained in the background for most of Air Mystery’s running time, occasionally making genially avuncular comments or suggestions, but largely leaving the heroes and heroine to their own devices. 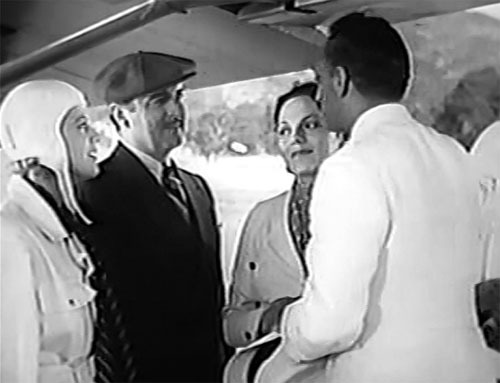 Above: Jean Rogers (far left), Bryant Washburn, and Delphine Drew are congratulated on a safe arrival in Nazil by Harry Worth in Tailspin Tommy in the Great Air Mystery (Universal, 1935). Washburn broke his string of Universal serial appearances with turns in a pair of 1936 serials for Stage and Screen Productions, a shoestring outfit run by father-and-son producers Adrian and Louis Weiss–who made a habit of signing innumerable former silent-era stars and of renting impressive sets constructed for bigger films, using them to lend prestige to their uneven and over-complicated serials. 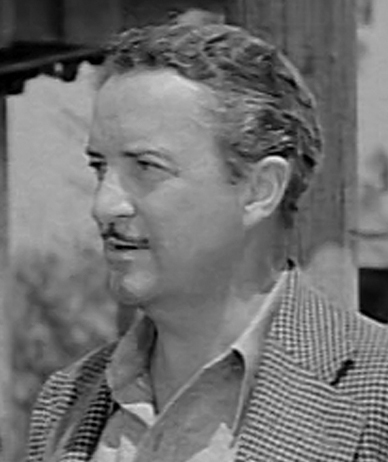 The Clutching Hand, Washburn’s first Weiss outing, featured Jack Mulhall as super-detective Craig Kennedy, who was investigating the disappearance of the scientist Dr. Gironda (Robert Frazer). Before vanishing, Gironda had perfected a formula for making artificial gold–which disappeared along with him, and sent the directors of the research corporation for which Gironda had worked scrambling in search of the missing man. Washburn was Denton, the most ruthless and unscrupulous of the corporation’s directors, and vied with many other good guys and bad guys–including Kennedy and the mysterious villain the Clutching Hand–in his pursuit of the lost formula. 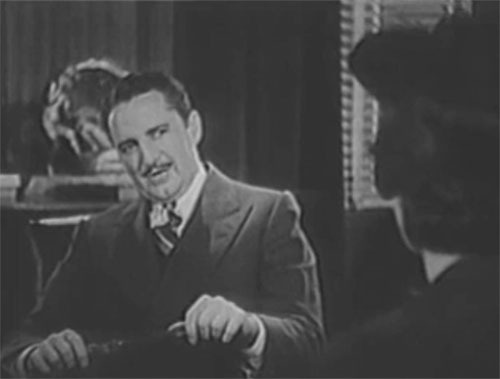 Though Washburn’s screen time was limited in Hand due to the serial’s overcrowded cast, he played the unmitigated scoundrel Denton with entertaining flair whenever he appeared–drawing coolly at a cigar while laying schemes, smugly and suavely parrying words with the serial’s innumerable other suspicious characters, and snapping brusquely at antagonists when things didn’t go his way. 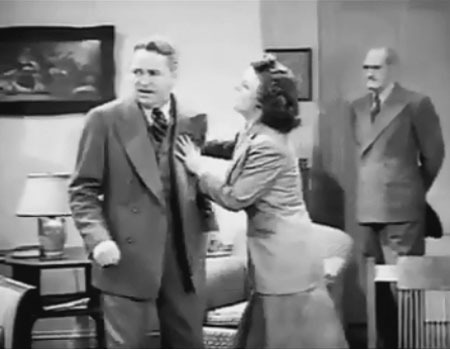 Above: Bryant Washburn tries to make a deal with secretary Ruth Mix (back to camera) in The Clutching Hand (Stage and Screen, 1936). The Black Coin, Washburn’s second Stage and Screen chapterplay, cast him as shipping magnate Frank Caswell, who was trying to acquire twelve ancient coins that held the key to a treasure, while also investigating the use of his company’s ships by a smuggling ring. Washburn’s character here was upstanding and convivial; as in Clutching Hand, he had to share screen time with an enormous cast, but made the most of his periodic appearances–warmly expressing his approval of the efforts made in his behalf by hero Dave O’Brien (who played the Caswell line’s chief investigator), and occasionally taking charge of his affairs himself, in businesslike but diplomatic fashion. 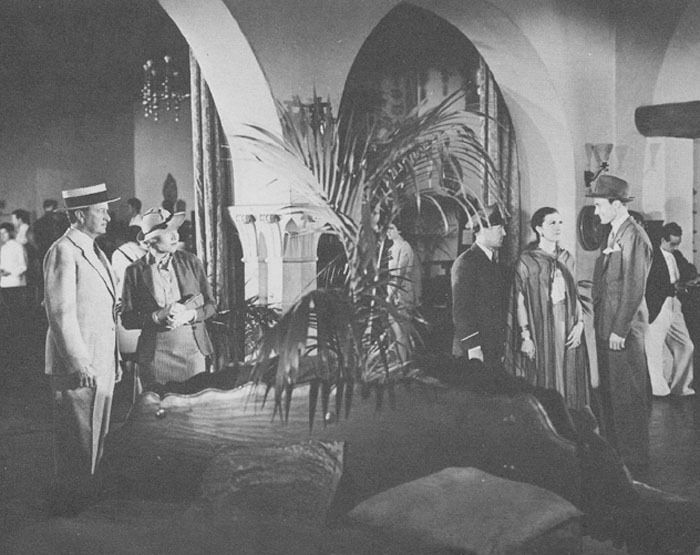 Above: A puzzled Bryant Washburn and Constance Bergen watch as Dave O’Brien (in fedora on the far right) confers with undercover agent Ruth Mix in The Black Coin (Stage and Screen, 1936). The man in uniform is comedian Snub Pollard. Jungle Jim (1936) was Washburn’s fourth and last Universal serial; unlike his previous three chapterplays for that studio, it cast him as a thoroughly rotten villain–one Bruce Redmond, who’d inherited the fortune of a wealthy relative when the latter was killed in a shipwreck off the coast of Africa, along with his wife and (apparently) his daughter Joan. Upon learning that Joan (Betty Jane Rhodes) was actually still alive, and was dwelling in the jungle as the “Lion Goddess” of a remote tribe, Redmond organized a safari to find and eliminate her, in order to hold on to his wrongful inheritance. Redmond also had the family lawyer and his guide murdered to keep them from locating the girl first–but still had to deal with the slain guide’s friend and colleague, Jungle Jim (Grant Withers), and with the fugitive criminal known as the Cobra (Henry Brandon), who ruled the Basumba native tribe by posing as the Lion Goddess’s father, and wasn’t willing to let Redmond remove the girl. 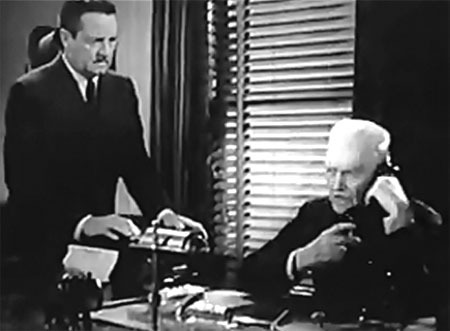 The Redmond character went from a confident schemer to a panic-stricken wretch over the course of the serial–eventually being thrust aside not only by Jim and the Cobra, but by his own henchman Slade (Al Bridge) as well; Washburn did an excellent job of portraying his villain’s slow disintegration, conducting himself with slickness and sharp authoritativeness in the early episodes but registering increasing fearfulness and indecision–and, finally, despairing rage–as Redmond was confronted with one peril after another while his plans went increasingly awry. 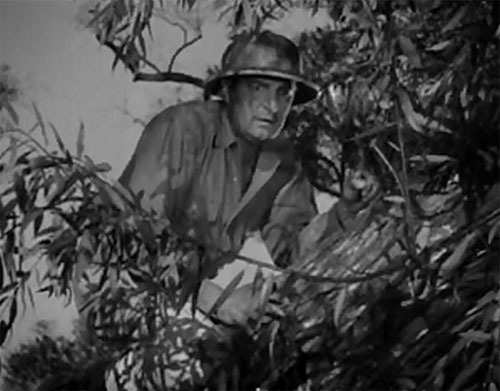 Above: Bryant Washburn climbs a tree to hide from jungle beasts in Jungle Jim (Universal, 1936). 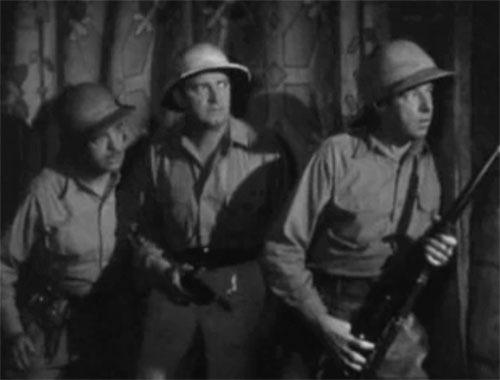 Above, left to right: William Royle, Bryant Washburn, and Al Bridge, lurking in one of the Cobra’s castle halls in Jungle Jim. Washburn continued to work as a character player in B and occasional A features during the remaining years of the 1930s and in the early 1940s; in 1940 he appeared in his first serial since Jungle Jim, Republic’s King of the Royal Mounted. As in Jim, he played a villain–Matt Crandall, a traitorous Canadian mine-owner who made a secret deal with Nazi agents, agreeing to provide them with the militarily valuable mineral “Compound X.” Washburn, whose character pretended to assist the Mounties’ investigation of the spy ring for most of the serial, affected friendliness with such ease and such seeming sincerity that it made it made the good guys’ misplaced trust in him seem entirely understandable. He also balanced slyness and furtiveness to good effect when Crandall was participating in skulduggery; he was crafty and poised enough when issuing routine orders to henchmen, but lapsed into cringing nervousness when in danger of exposure or when reporting failures to his superior, hard-bitten Nazi agent Kettler (Robert Strange). 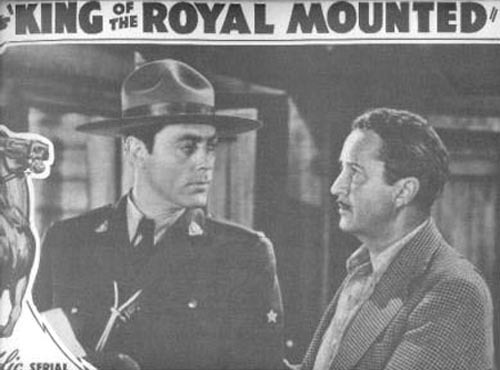 Above: Allan Lane as King of the Royal Mounted (Republic, 1940) confers with secret traitor Bryant Washburn. 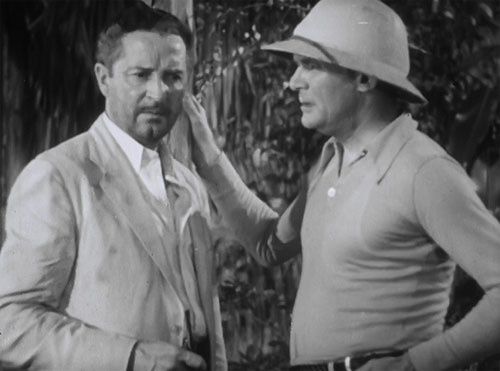 Above: Bryant Washburn rather reluctantly allows henchman Harry Cording to hit him on the head in order to preserve his blameless cover in King of the Royal Mounted. Adventures of Captain Marvel (Republic, 1941) featured Washburn as archeologist Henry Carlyle, a member of an expedition that discovered an ancient and deadly “atom-smashing” weapon called the Golden Scorpion. One of the expedition members assumed the identity of “the Scorpion” and started killing off the others in hopes of gaining sole control of this device; Carlyle was the first archeologist to be taken out of the Scorpion suspect pool, killed off in Chapter Three. Washburn played this ill-fated scientist in somewhat mild-mannered but courteous and amiable fashion, making him the most pleasant member of the serial’s otherwise gruff and sinister group of red-herring characters. 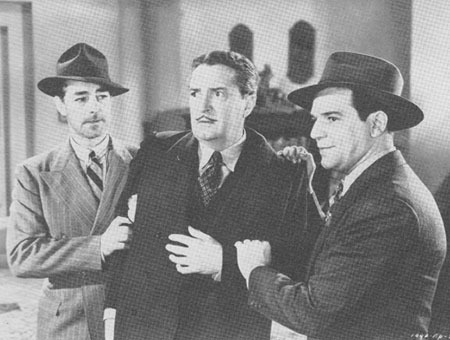 Above: Kenne Duncan (far left) and John S. Bagni threaten to put Bryant Washburn under a guillotine in Adventures of Captain Marvel (Republic, 1941). Washburn’s last two serials were both Columbia efforts, and were both directed by James W. Horne–a one-time comedy director fond of interpolating out-of-place humor into his serials, and of eliciting comically over-the-top performances from his actors. In The Spider Returns (1941), his first serial collaboration with Horne, Washburn was featured as Westfall, a chemical-factory owner and a member of a board of industrialists targeted by a masked saboteur called the Gargoyle; he was also suspected of being the Gargoyle himself at times. Washburn displayed his customary suavity in his first scene in Returns–combining dignity and shiftiness in proper “suspect” style–but soon lapsed into the frantic overacting typical of the players in Horne’s serials; he veered between exaggerated terror (of the Gargoyle) and exaggerated indignation (at the Gargoyle’s sabotage activities) for most of the chapterplay. Above: Bryant Washburn and Joseph Girard in The Spider Returns (Columbia, 1941). The Horne-directed Captain Midnight (1942), Washburn’s last serial, gave him a bigger role than Spider Returns; as John Edwards, the inventor of a plane-detecting device, he provided the impetus for the serial’s action–with spy Ivan Shark (James Craven) and aviator hero Captain Midnight (Dave O’Brien) engaging in a constant tug-of-war over the hapless scientist and his gadget. In Midnight, as in Returns, Washburn was urbanely dignified at the start of the serial, but quickly lapsed into a hamminess more suited to the silliness of the Horne-influenced script and the over-theatricality of his co-stars. His defiances of Shark were (alternately) bombastically scornful and hysterically despairing (“I refuse! Torture me if you will, but I won’t do anything more to help you!”), while his paranoid querulousness when Edwards temporarily lost his memory in the serial’s mid-section was outrageously cartoonish (unlike his more sympathetic amnesiac act in the earlier Call of the Savage). Washburn’s performance in Midnight, like the serial itself, was impossible to take seriously, but was quite entertaining in an off-the-wall way. Above: Dorothy Short tries to calm Bryant Washburn as Joseph Girard watches in Captain Midnight (Columbia, 1942). 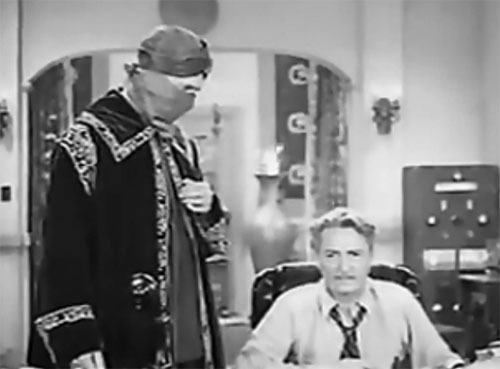 Above: The masked James Craven questions Bryant Washburn in Captain Midnight. Washburn kept working as a character player–principally in B-films for Republic and RKO–up until 1946, when he virtually retired; he made a few acting appearances during the next few years, but by 1948 had finished with the picture business for good. Unlike many other silent stars, he seems to have held on to some of his leading-man earnings, despite the stock crash of 1929; though he worked more sporadically in films than many other B-list actors did, the 1940 federal census lists his yearly income as 2200 dollars (a respectable sum in those days) and also shows him as owning a home valued at 8500 dollars (instead of being listed as a renter, like most serial players). One assumes that this financial comfortableness had something to do with Washburn’s decision to exit the screen much earlier than peers like Jack Mulhall or William Farnum did; in any case, he enjoyed a lengthy retirement, passing away in Hollywood in 1963. Bryant Washburn might not have been as stern and as venerable-looking as many of the serial genre’s older supporting players, but the kindly gentility that he lent to his serial solid citizens made them seem just as dependable–and often more agreeable–than those played by more severe performers. His serial heavies, on the other hand, were as hateful and convincingly slimy as his serial good guys were pleasant and convincingly honorable–showing that he was not merely a genteel screen “type,” but a talented character actor. Above: Bryant Washburn offers a thoughtful suggestion in The Call of the Savage (Universal, 1935).